Production of the Brazilian version of the Fiat Uno, known as the Mille, has finally ended after a 30-year run. Fiat has been forced to end the Mille due to new legislation that came into effect on 1 January 2014 that requires all new cars to have airbags and ABS fitted as standard. It's the law that's also responsible for the end of Volkswagen Type 2 production. The Fiat Mille was introduced in 1990 as an entry-level version of the Uno. But such was its success, the Mille became a fully-fledged member of the model line-up, eventually supplanting the original it was based upon. Sales of the 999cc supermini, which was available at the lowest taxation rate, exceeded 10,000 per month until 2010. Right to the end of its life, the Mille remained popular in Brazil because of its super-low purchase price and rugged layout, with such features as long-travel suspension and impact-absorbing bumpers. In 2004, the Mille received a new front end up updated interior, and it's in this form that the car remained in production until the end of 2013. 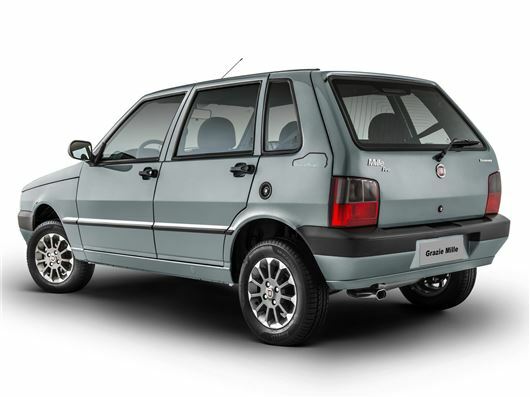 Despite the new look, the essential character of the neat-looking Giugiaro-styled original continued to shine through. A total of more than 3.6 million Unos and Milles have been sold in Brazil since the launch of the first-generation Uno, which had been built there since 1984. All the classics are getting killed off by regulation.